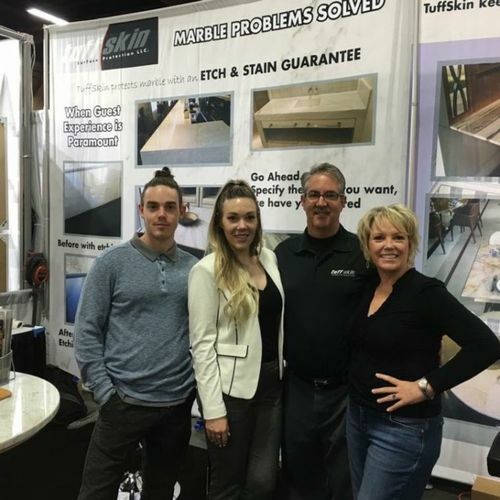 As owners of TuffSkin Surface Protection, Lelia and Frank Friedlander are particularly proud that their son, Jake, and daughter, Katie, have become more involved in their family business over the last year. Jake Friedlander is playing a more active role with installation and training while his sister, Katie, is expanding the company's California distribution and managing marketing projects. Nevada Business magazine recently named the Friedlanders as a finalist in the "Outside the Box" category for southern Nevada. They were highlighted as a business that offers a product or service that is unique to Nevada. "The Family Owned Business Awards has been around for six years and each year our judges have the difficult task of choosing only three companies in each category from a multitude of nominees," said Tarah Richardson, editor-in-chief of Nevada Business. "Being recognized as one of the finalists shows that leaders in our community see the hard work and contributions of these family-owned businesses and know they deserve to be honored for their efforts. We are privileged to acknowledge these families and are excited to see them continue to grow their businesses." Lelia Friedlander. co-owner of TuffSkin Surface Protection, attended the awards event with her husband, son and brother. "As a mom and as a business owner, I'm so grateful to the magazine for spotlighting us as a finalist in this incredible awards program," Friedlander said. "As parents, we're so happy that our children share our passion for the family business. We take a lot of pride in their achievements." Anticipating potential challenges of integrating family members in their business, Frank and Lelia partnered with a business coach to foster their relationships and strategize about each family member's unique talents and work style. "Our son and daughter are both bringing a lot to our business," she said. "It's our job as business owners and as parents to ensure our growth as a company while offering our kids the opportunities to develop their skills." For more than eight years, architect- and designer-recommended TuffSkin has been solving housekeeping and maintenance issues in hotel rooms and lobbies, restaurants and bars. The company serves hospitality, commercial and residential clients across the United States, Canada and beyond.